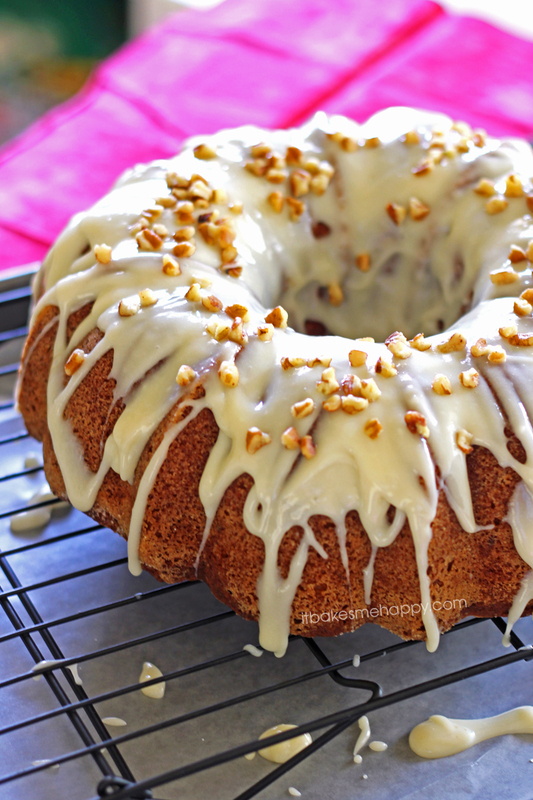 Soft, banana cake filled with pecans and iced with a sweet maple cream cheese frosting make this Banana Nut Cake with Maple Cream Cheese Frosting the perfect addition to your next family gathering. A while ago I borrowed my mother in laws bundt pan with the intention of baking a family recipe, needless to say it didn’t happen. Time passed and one day when my mother in law came over to visit she brought me a brand new pan, happy day! I stowed my shiny new pan in my cookbook cabinet and forgot about it for a few weeks. Last week our women’s group at church had an activity to celebrate the start of school (and the minimal freedom that brings from those with school age children) but most importantly it was an excuse to get together, chat and eat pizza. So of course I wanted to bring a dessert. I had a few over ripe bananas lying around, so I decided to bake a cake. It turned out to be quite delicious and remember I’m not a big cake fan. A moist, banana cake filled with pecans and iced with a sweet maple cream cheese frosting; if you like bananas, you’re going to love this cake. Enjoy and happy baking! Preheat your oven to 350º and prepare a bundt pan with cooking spray and sprinkle in two Tbs of sugar to coat. In the bowl of your stand mixer beat the butter, sugars, and cinnamon until fluffy. Add the eggs one at a time. In a mixing bowl combine the Greek yogurt, bananas, oil and vanilla. In a separate bowl sift together the flour, baking powder, baking soda, salt and flour. Alternately add the wet and the dry ingredients to the butter mixture, until the batter just comes together and fold in the pecans. Spread the batter into the pan and bake for 55-60 minutes until golden and a tester comes out with just a few crumbs. Cool in the pan for 10 minutes, then invert onto a wire rack and cool completely. In a small bowl stir together the cream cheese, powdered sugar, milk and maple syrup. Drizzle the icing over the cake and sprinkle the remaining pecans, slice and serve.